It seems as though winter is upon us in Park City. We’ve had two days of snow and cold weather (which we’ve had before this fall, but now it feels like its here to stay!) I spent part of my evening pulling out my winter boots and jackets and putting away my summer clothes. Then I enjoyed the rest of my night watching the Red Sox WIN the World Series!!! The World Series inevitably means the end of fall, day light savings is just around the corner and tomato season is on its way out. One of my favorite childhood winter lunches was tomato soup and grilled cheese. It was hearty, warm and satisfying on a cold day. Heat the oven to 400 degrees and line a rimmed baking sheet with foil. Lay the tomatoes cut-side down. Add the garlic cloves (with skins on). Sprinkle with olive oil and season with salt. Roast until the tomatoes are soft and caramelized, about 30-45 minutes. In a large stock pot saute chopped onion in 2 tablespoons of olive oil until translucent, remove from heat. When the tomatoes are done roasting, remove them from the oven and transfer tomatoes, pulp and juices to a large stock pot with onion. Squeeze the garlic from its skin and add it to the pot. Add 3 cups of the chicken stock, bay leaf, and butter. Bring to a boil, reduce heat and simmer for 15 to 20 minutes or until liquid has reduced by a third. Remove the bay leaf and use an immersion blender to puree the soup until smooth (or transfer soup to a regular blender and puree before returning to the stock pot). Return soup to low heat, add cream and adjust consistency with remaining chicken stock, if necessary. 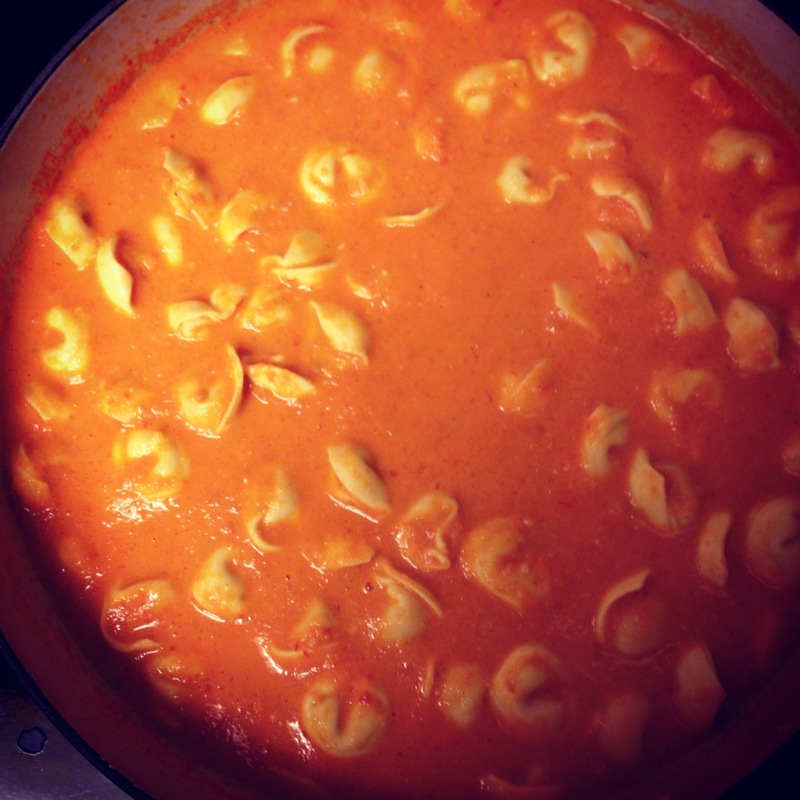 Add uncooked tortellini to the pot and continue to simmer on low heat for another 5-7 minutes. Season to taste with salt and freshly ground black pepper. Ladle into bowls and garnish with freshly chopped basil and shredded Parmesan cheese. Serve with fresh bread and enjoy! 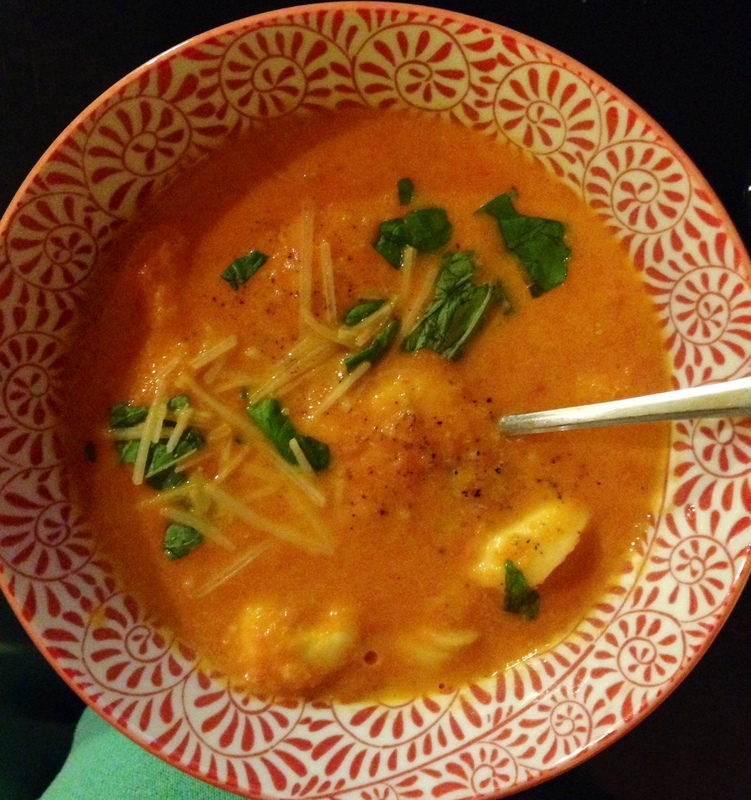 This entry was posted in Recipes, Soup and tagged creamy tomato soup, roasted tomato soup, Soup, tomato soup, tomato soup with tortellini, tomato tortellini soup, tomatoes by skibootsinthekitchen. Bookmark the permalink.